If you read my Too Faced Brand Focus post, you will know that I am a huge fan of the formula of the eyeshadows from the brand. The original Chocolate Bar palette is one of my favourite eyeshadow palettes ever due to the shade selection, the texture of the shadows and, well, the fact that it smells of chocolate doesn't hurt! 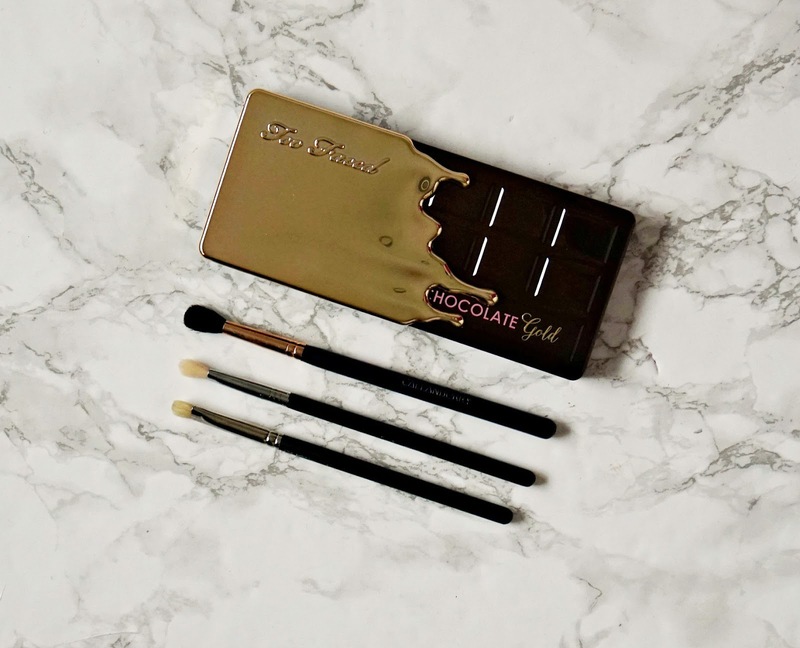 I was delighted to find the new Chocolate Gold palette under the tree at Christmas and I want to share my thoughts on it with you today! I love the packaging - similar to the original Chocolate bar palette but with the effect of melted gold poured over half of it. Like all Too Faced palettes, it comes with a little guide that shows how to create a number of looks - something I think all palettes should have! Inside the lid is a good sized mirror and there are sixteen shadows in the palette - 4 mattes and 12 metallics/shimmers in some neutrals and mainly jewel tones. Unlike the original palette, the names of the shadows are written above them rather than on a plastic insert, which I prefer. Money Bags: Emerald green with a pearl sheen finish. Pigmented and buildable, easy to apply and blend. Chocolate Gold: Yellow gold metallic - soft to touch, pigmented and easy to apply. Rich Girl: Pale gold/silvery/grey hybrid . Smooth to touch, pigmented and easy to apply. Cocoa Truffle: Matte warm medium brown. Moderately pigmented, buildable, soft to touch and easy to blend. Decadent: Matte cool toned black. Moderately pigmented but can be intensified by using a damp brush. Love & Cocoa: Buttery soft, metallic bronze. Pigmented, smooth, easy to apply. Old Money: Orangey copper metallic. Creamy to touch, pigmented and easy to apply. New Money: Stunning, bright fuschia pink with a sheen finish. Pigmented, soft and easy to apply. Famous: Copper/bronze hybrid with a metallic finish. Soft, smooth, pigmented and easy to apply. Classy & Sassy: Rose gold/copper hybrid with a metallic finish. Buttery soft, pigmented, blendable and long-lasting. So Boujee: Light brown matte. Moderately pigmented but buildable. Smooth to touch, easy to apply and blend. Holla For A Dolla: Medium bronze with olive tones in a shimmery finish. Soft to touch, pigmented, easy to apply. Gold Dipped: Metallic mid-gold - soft to touch, smooth, blendable and easy to blend. Drippin' Diamonds: Metallic silver, pigmented and easy to apply. My least favourite in the palette purely because silver doesn't really suit me! Rollin' In Dough: Warm cream matte - smooth and soft to touch, pigmented and easy to apply. In my opinion, this is one of the most exquisitely beautiful palettes on the market at the moment. 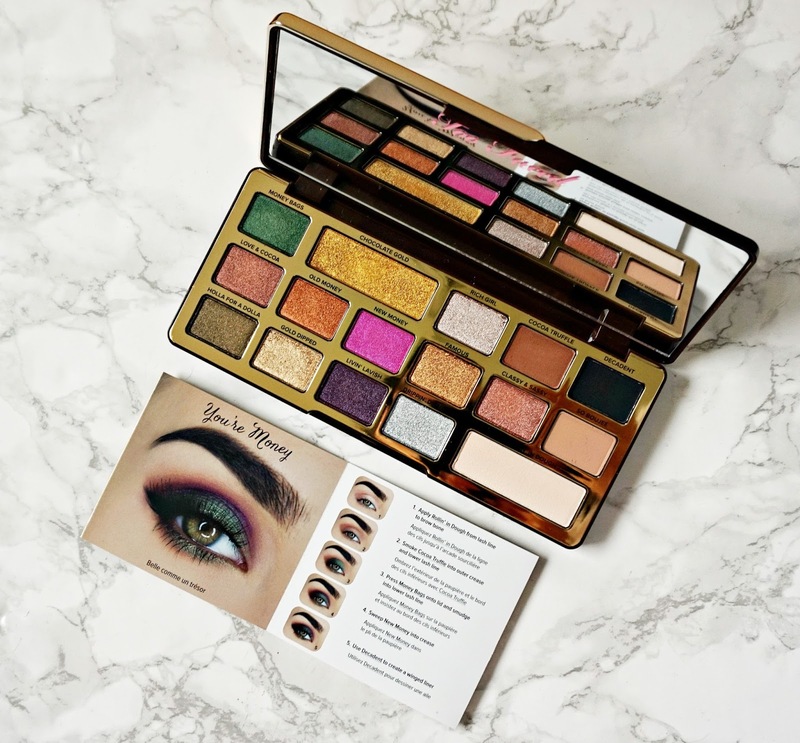 Some of the shades are very similar to Pat McGrath Mothership II Sublime, which is a lot more expensive so if you liked the look of that one, this Too Faced palette is a great alternative. The standard is as expected from Too Faced - pigmented, smooth and soft in texture and the wear time is great. Overall, I love this palette and am delighted to have it in my collection! I'd love to hear your thoughts on the Chocolate Gold eyeshadow palette? Which is your favourite shade? Did you know that Cult Beauty also stock Too Faced products now? Don't forget to enter my Charlotte Tilbury Bronze & Blush Giveaway here.